Autism spectrum disorder (ASD) is a neurodevelopmental disorder that affects a person’s social interaction, communication and behaviour. It is usually diagnosed in childhood, with some of the key symptoms being present from before the age of three (although diagnosis may be much later than this). In this article, we shall look at the pathophysiology, diagnosis and management of autism. The UK prevalence of autism spectrum disorder is around 1% and is more common in boys than girls. It is more prevalent in children that were born prematurely, although the reason for this is not yet clear. Other factors thought to increase the risk of developing ASD in the future include perinatal hypoxia and advanced maternal or paternal age. The exact pathophysiology of autism spectrum disorder is unknown and may be multi-factoral. It is a feature of some genetic syndromes such as fragile X syndrome, tuberous sclerosis and Angelmann syndrome. Twin studies have shown a strong genetic aetiology, but it is only recently with the development of microarray testing that specific genes are beginning to be identified. Even with recent advances, chromosomal analysis only gives a diagnosis in around 5% of cases and microarray can pick up a further 10% of cases. 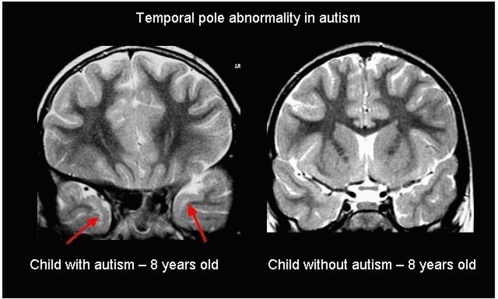 Fig 1 – Structural abnormalities have been demonstrated in those with autism, but it is unclear how this produces the features of the disorder. This includes the most well-known symptom of autism – poor eye contact; but it can also include failure to use facial expression or body language during social interactions; particularly with strangers. It also includes problems making friends with peers, and difficulty in reading social situations (such as failing to pick up on others emotions). This includes delay or failure to develop either spoken language or sign language to communicate with others. Also can be a failure to initiate or continue conversations. Included in this is the abnormal use of language; either with idiosyncrasy or stereotyped language (e.g. echolalia – repetition of another person’s spoken words) or abnormal intonation, pitch, rate or rhythm of speech. This includes abnormal preoccupations with subjects beyond the limits of normality. It may be a preoccupation with something unusual (traffic lights), or just an all-encompassing obsession (everything about dinosaurs down to their anatomy, classification, date they were discovered, and who by etc…). It also includes a need for routine, with great upset if this is disrupted. There may be a need for certain rituals to be performed by themselves or others in a specific way as part of this routine (for example when going to bed there must be certain toys placed in specific places, the light switch touched a certain number of times and then the blankets placed in a certain way before the child will sleep). There may be abnormal preoccupations with toys and other materials – for example spinning wheels on cars for the vibration it makes, or licking metal objects. There may be “motor mannerisms” with the classical hand-flapping or other such repetitive and compulsive movements, which can occur more when the child is excited or upset. Children with autism may also present with sensory issues that can impact significantly on their health and or quality of life. They may only eat certain foods (due to not liking the texture or needing it all to be a certain colour) and may have a severely restricted diet. They may not tolerate loud noises or seem to have a very high pain threshold. They may self-harm (head banging or hitting themselves) as a part of their motor mannerisms (for example pinching themselves repeatedly) or as an outlet when frustrated. They may not tolerate their hair being cut or their teeth being brushed, and thus it can be a challenge for parents to maintain their child’s personal hygiene. 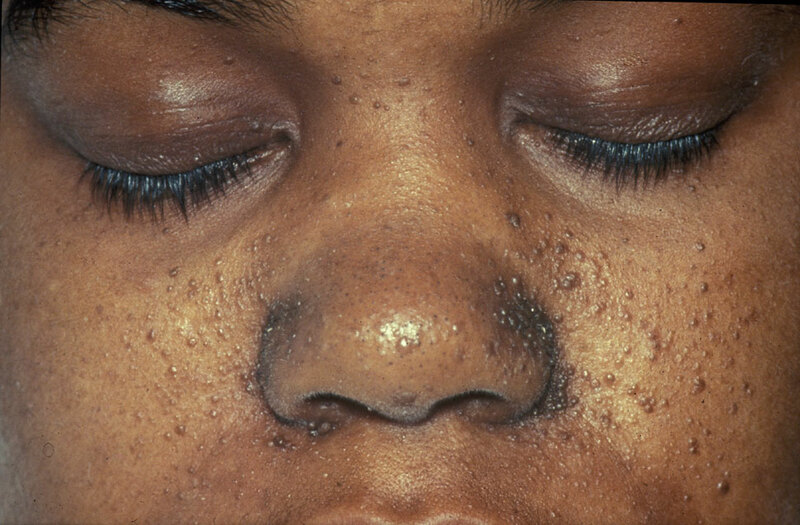 Skin stigmata of neurofibromatosis or tuberous sclerosis using a Wood’s light. Signs of injury, for example self-harm or child maltreatment. Congenital anomalies and dysmorphic features including macrocephaly or microcephaly. A lack of social attachments. Abnormal / delayed receptive or expressive speech development. Abnormal or lack of symbolic play (e.g. having a pretend tea party). Learning difficulties – It can be very difficult to diagnose autism in a child with learning difficulties, although the two can co-exist – what is important to determine is if the behaviours exhibited are in line with the child’s developmental age or would be explained by the comorbid diagnosis of ASD. Attachment disorders – Due to the absence of adequate social and emotional interaction between the child and parent there is failure to develop a bond between them. The child may fail to seek comfort when distressed or fail to be appropriately worried when picked up by someone unfamiliar and actively seek attention from strangers. Rett’s Syndrome – A rare genetic syndrome occurring mostly in girls. It presents in affected girls who develop normally for the first 6 months, but then by 18 months of age begin to regress and lose skills. Marked features include speech delay and repetitive hand movements, in particular hand-wringing and flapping. Schizophrenia – Extremely rare in children, it can present with disordered language and odd behaviours that can also be a feature of ASD. The diagnostic criteria for schizophrenia include hallucinations and delusions which are not a feature of ASD. Specific language disorders – There are now separate diagnostic criteria for conditions that affect a child’s social speech and communication only. Thus this is a diagnosis that is more likely to be made by a Speech and Language therapist, as they include only the use of specific restrictions and impairments of the use of social language. Autism spectrum disorder is a clinical diagnosis, with no specific blood or imaging tests currently available. The main focus of investigation is to gather information to support or dismiss a diagnosis. The symptoms should be consistently present in different environments (i.e. both at home and at school) – thus at the very least a report of how the child functions at school is usually sought and a school observation may be performed. The diagnosis should be made through a multi-disciplinary team from various agencies, and then a meeting held with all interested parties (the MDT team, parents and teachers) to come to a consensus. The MDT should ideally consist of an educational psychologist and speech therapist, as well as either a Community Paediatrician or Child Psychiatrist. There are no medications to specifically treat autism, although medication may be required to treat other co-morbid conditions such as ADHD. Very rarely in older children with marked aggression, antipsychotic medications have been used – but these would be under the direction of a child psychiatrist. Behavioural management strategies – visual timetables, preparation and explanation for changes in routine. Educational measures – special educational measures put in place to access mainstream schooling through an Educational Health Care Plan (previously known as a Statement of Educational Needs) or to attend a special school. For some of the children who are on the milder end of the spectrum, just having the diagnosis is in itself enough for school to adapt to their needs. Adequate treatment of co-morbid conditions is also helpful; for example use of melatonin for sleep can aid the child’s behaviour and education. The most common co-morbid conditions include ADHD, sleep disorders, learning disability and mental health problems such as anxiety and depression. The features of autism exist on a spectrum – at one end there will be children who are able to learn ways to manage their difficulties and live independent lives in successful careers with children of their own. At the other end are children who are so severely affected that they will never be able to live independently, most remaining with the family throughout their lives. (1) Baird G1, Simonoff E, Pickles A, Chandler S, Loucas T, Meldrum D, Charman T. Prevalence of disorders of the autism spectrum in a population cohort of children in South Thames: the Special Needs and Autism Project (SNAP). 2006 Jul 15; 368(9531):210-5. (2) Bailey A1, Le Couteur A, Gottesman I, Bolton P, Simonoff E, Yuzda E, Rutter M. Autism as a strongly genetic disorder: evidence from a British twin study. Psychol Med. 1995 Jan;25(1):63-77. (3) Yiping Shen et al Clinical Genetic Testing for Patients With Autism Spectrum Disorders Pediatrics. 2010 Apr; 125(4): e727–e735. (4) Schmitz C1, Rezaie P. The neuropathology of autism: where do we stand? Neuropathol Appl Neurobiol. 2008 Feb;34(1):4-11. Epub 2007 Oct 26. (7) Kuzniewicz MW1, Wi S2, Qian Y2, Walsh EM2, Armstrong MA2, Croen LA2. J Pediatr. Prevalence and neonatal factors associated with autism spectrum disorders in preterm infants. 2014 Jan;164(1):20-5. Epub 2013 Oct 22. (8) Kolevzon A, Gross R, Reichenberg A. Prenatal and Perinatal Risk Factors for Autism A Review and Integration of Findings Arch Pediatr Adolesc Med. 2007;161(4):326-333. What is the prevalence of autism spectrum disorders in the UK? Before what age should symptoms be present from to diagnose Autism? What percentage of Autism cases does chromosomal analysis detect? NICE guidelines suggests a general examination including which of the following? What rare genetic condition causes predominantly girls who develop normally up to 18months of age and then regress and lose skills?